CAR is once again struggling through a period of profound instability, and its population needs help. Most humanitarian organizations, however, have either left the country or reduced their presence because of the general insecurity and a spate of targeted attacks on international NGOs. Central African Republic (CAR) is once again struggling through a period of profound instability, and its population needs help. Most humanitarian organizations, however, have either left the country or reduced their presence because of the general insecurity and a spate of targeted attacks on international NGOs. The circumstances notwithstanding, the international community must work to create conditions that will enable the delivery of emergency relief to people in need. CAR already lags far behind most other countries in health indicators. Humanitarian and development agencies must maintain, and indeed scale up, their commitments, taking adequate measures to respond both to emergency and long-term needs. In December 2012, the Seleka rebel coalition launched an offensive against CAR’s government. A month later, the warring parties signed a cease-fire agreement, but on March 24, 2013, Seleka took control of Bangui, the capital, and effectively overthrew the government. The state security forces largely disbanded. President François Bozizé fled the country, and Michel Djotodia, a Seleka leader, proclaimed himself the new president. One month later, on April 18, an Economic Community of Central African States (ECCAS) conference in N’Djamena, Chad, recognized Djotodia as the head of a transitional government that was mandated to hold elections in the country within 18 months. ECCAS also authorized the deployment of an additional contingent of 1,500 soldiers to strengthen the existing Mission for the Consolidation of Peace in the Central African Republic (MICOPAX), which ECCAS has overseen since 2008. 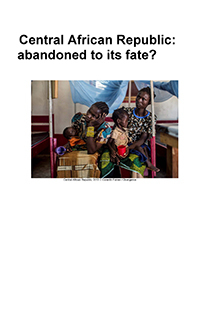 Doctors Without Borders/Médecins Sans Frontières (MSF), which has been working continuously in CAR since 1996, scaled up its programs to respond to increasing needs in the wake of the change in government. Despite general insecurity and specific incidents such as robberies that forced the temporary evacuation of staff, MSF has never suspended activities. Currently MSF operates nine programs: in Carnot, Paoua, Boguila, Bossangoa, Batangafo, Kabo, Ndele, Bria, and Zemio.